Which Web Browser - Safe Surfing - How safe is your web browser? I have my opinion about which browser I use and recommend, but I did some research to find the general consensus of the internet. I’m not sure if you knew this, but when Googling sometimes it’s best to ask a question rather than just searching a term. 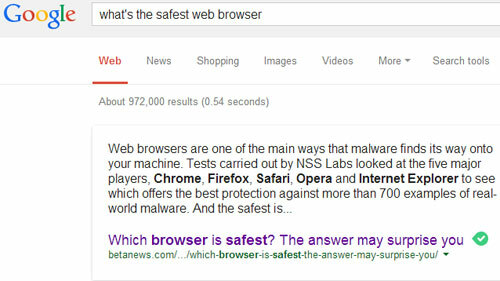 I asked Google: What’s the safest web browser? When Google has an answer for you, rather than just a list of search results it will put that answer in a box at the top of the page. Believe it or not, the answer Google gave actually suggested that Internet Explorer was the safest with Google’s own Chrome coming a close second. This is based on tests carried out by NSS Labs and published in May of 2013… So yes, this information is over a year old, and we all know how fast things change on the internet. So I dug a bit deeper and looked for a newer opinion. I found another blog post on tiptopsecurity.com where the writer recommended Firefox as his personal choice for safest browser. I found another webpage which demonstrated that Internet Explorer was actually the fastest browser, especially if you’re using Windows 8. Basically, it boils down to my original recommendation; Use what you like. I’d also recommend you consider this: Internet Explorer is a Microsoft product and thus is going to be the target of hackers and virus creators for years to come simply for being so. And now I guess you’d like to know my personal recommendation. Well, I have been a Google Chrome user since it was still in Beta so it shouldn’t be a surprise that I recommend Chrome. I like the streamlined layout, the tabbed interface and the ability to add-on extensions like adblockers. That’s not to say that you can’t get a similar experience with another browser like Firefox, but Chrome is my preference. What makes Chrome so good? It’s all in the setup. Ordinary Chrome isn’t much better than Firefox or Internet Explorer, but that’s not what I recommend. My recommendation is to utilize AdBlock and Adblock Plus to make Chrome an even safer web browser. With these extensions running you will no longer see advertisements or popups, and it even blocks the ads which play before YouTube videos. Many people don’t realize that Java and Flash update notifications are often viruses and malware in disguise, just waiting and hoping you’ll click and allow them access to your system. AdBlock will stop those fake notifications from displaying on your screen. Follow five easy steps and you’ll be ready to safely surf the world wide web. And if you need assistance just remember; Install Heroes – Call and we’ll come to the rescue! In the new tab search for “adblock” and you’ll see a list of results. 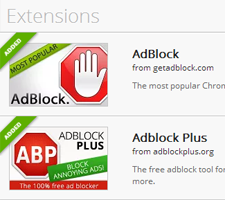 Click the Add button to enable both AdBlock and Adblock Plus extensions.